When it comes to food or anything food related, I’m an unwavering perfectionist in every sense of the word. It’s a compulsion – one that forces me to spend hours studying a given entrée, drink, or what have you, until I find a rendition that in my view, perfectly exemplifies what this particular item should be. Six months ago, it was this perfectionism that led me on an epic journey into the world of espresso making. But before I go any further, let me give you a bit of background about myself. I’m a coffee guy, plain and simple. I love it. There’s not a day that goes by that I don’t have at least a pair of coffee drinks in the morning. But as with any vice, there’s a problem: coffee isn’t cheap. Step into any main coffee house and you’re spending at least a couple bucks an espresso, $3-5 for milk and espresso drinks, and before you know it, you’re spending almost $10 a morning on coffee. Even worse, you have to take the time to go to the coffee shop and then wait in line to get it. After realizing the inefficiency of my coffee habit – namely, the amount I was spending weekly and time I wasted procuring it – I decided there had to be a better way. And that, ladies and gentlemen, is how I was introduced to the world of home espresso making. In America, espresso is arguably one of the most misunderstood drinks there is. Whether you’re going to Starbucks or a local coffee shop, if your espresso tastes burnt, exceptionally dark, sour, or notes any other distinctly unpleasant tastes, there’s a very, very high probability it’s being made incorrectly. It may be the coffee itself, or it may be the technique used to make the espresso. Contrary to popular belief, espresso is not an acquired taste. If it tastes bad, in all likelihood, it is bad. And in truth, unless you live near a major city, finding exceptionally made espresso is nearly impossible (and even then it can be challenging). So how can you tell what a good espresso is? There’s really no simple answer. Espresso is like wine, in that each espresso roast notes its own flavor characteristics. But as a general rule, a good espresso should note a distinct flavor. It may be a fruity flavor, it may be a nutty flavor, it may be a chocolatey flavor, or it may be any combination of the three. But if you try an espresso and you’re left with a markedly ashy taste, something’s probably wrong. In my case, I was fortunate enough to get fantastic espresso from Intelligentsia and Metropolis Coffee in Chicago. Both helped teach me what espresso should taste like, as well as what to avoid. So how does one achieve the perfect espresso? Thankfully, we live in a beautiful age of information – one in which the internet can make a genius out of anyone on any given topic. Pick a subject, and you’ll find a multitude of websites dedicated to educating you about it. Espresso is no exception. When I finally decided to take the plunge into making my own espresso, I found that a multitude of fantastic resources were available online to help even the most basic of novices learn how to become a barista, with Home-Barista.com being one of my favorites. They have not only an incredibly detailed “Guide to Espresso”, they also have a great community of espresso enthusiasts that discuss virtually every element of espresso making. 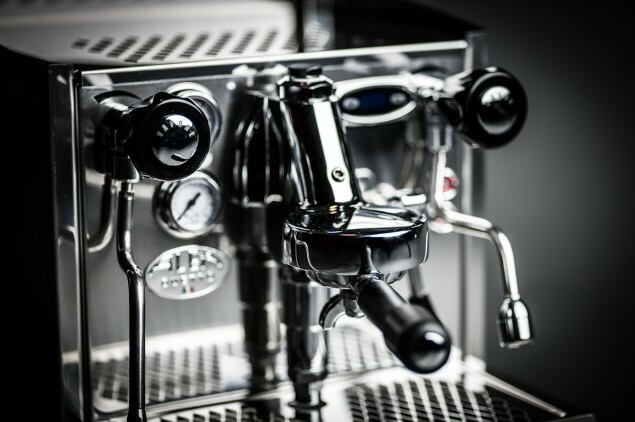 Ultimately, I’ve found that perfect espresso boils down to four things: 1) the coffee itself, 2) the espresso machine, 3), the espresso grinder, and 4) the barista tools and techniques. Each are vital to the espresso making process, which is why I’m going to be detailing each in separate articles (except for the coffee, which will be detailed in all three). First is the coffee. It absolutely has to be quality, freshly roasted coffee from a purveyor that knows how to roast. This pretty much eliminates purchasing coffee from the grocery store. Instead, I buy all my coffee online. Some of my favorite sources: Metropolis Coffee, Redbird Coffee and Counter Culture Coffee. If I buy from Metropolis, it arrives a day after roasting. If I buy from Redbird Coffee, it arrives 3 days post roast. The key is knowing the exact roast date of the coffee, and subsequently figuring out the coffees optimal time to use it. Some espresso likes a short rest, some a little longer. The second element to the perfect espresso is the machine. 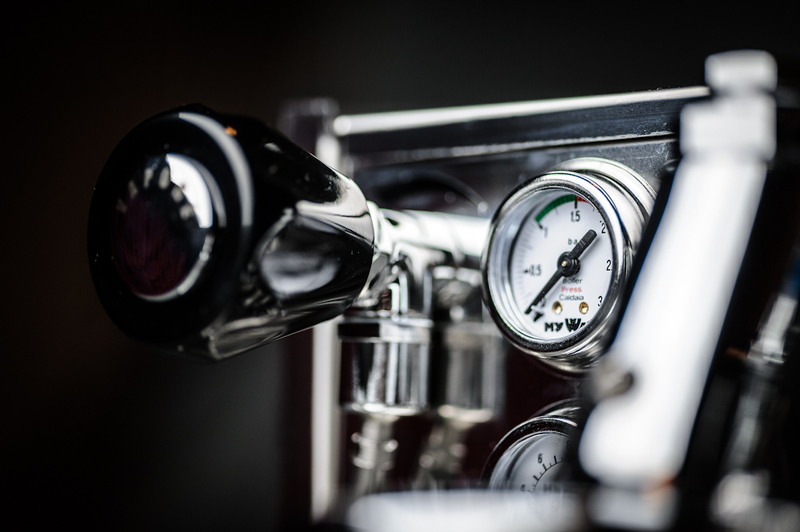 You need a machine capable of maintaining a consistent brew pressure of 8-9.5 bar and a temperature of 90 – 96 degrees Celsius. As I’m about to detail, I opted for the Alex Duetto II by Izzo, which is capable of doing both with immense precision and consistency. Thirdly is the grinder. I’m going to be talking about espresso grinders in a separate article, but the key is to find a grinder capable of delivering a consistent grind fine enough to match the espresso you’re preparing. 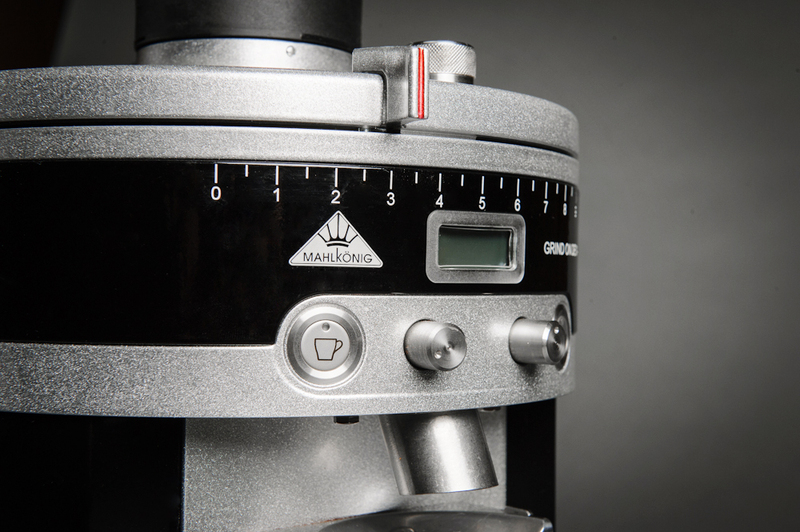 I opted for the MAHLKÖNIG K30 Vario – a commercial grinder that not only delivers an incredibly consistent grind, it also makes adjusting the fineness and amount of espresso ground incredibly simple. Lastly is the barista tools (and corresponding technique). Again, I’m going to be writing a dedicated article for barista tools, but I opted for a range of tampers and other accessories from TORR, all of which I’ve come to love and use every day. So that’s the overview of what you need to make the perfect espresso; now we’ll look at the first piece of equipment you’ll need to make it happen: the machine. Enter the world of espresso making, and you’re immediately inundated with a gargantuan assortment of espresso machines spanning the gamut of price and features. Anywhere from a few hundred to $10,000. It boils down to temperature consistency, ease-of-use, and at the very high end, style. As already noted, to create the perfect espresso, you need a consistent brew temperature and pressure with every shot. Because each espresso roast notes different flavor profiles at different temperatures, the ability to adjust and maintain a precise temperature is paramount to bringing out the best possible flavors from each espresso blend. After spending hours researching various machines, I finally picked the Alex Duetto II by Izzo, and I did so for a variety of reasons. 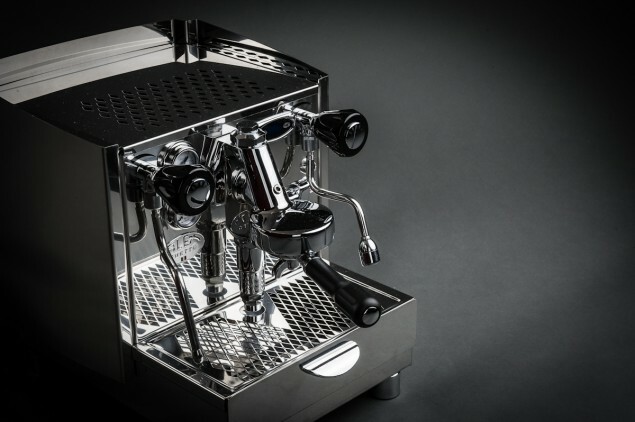 Simply put, the Alex Duetto II boasts nearly all of the features of the most expensive home espresso machines at a fraction of the cost ($2,500 for the Duetto II vs. $5,500 and up for the more expensive machines). At the other end of the spectrum, compared to other, less expensive espresso makers, the Alex Duetto II notes several key features that places it firmly above lesser models, especially when you’re new to home espresso making. For home baristas, especially those making their first forray into the world of home espresso, the Alex Duetto II really is the perfect blend of price, performance and capabilities. Let’s look firstly at the features you’ll find on the Alex Duetto II by Izzo. 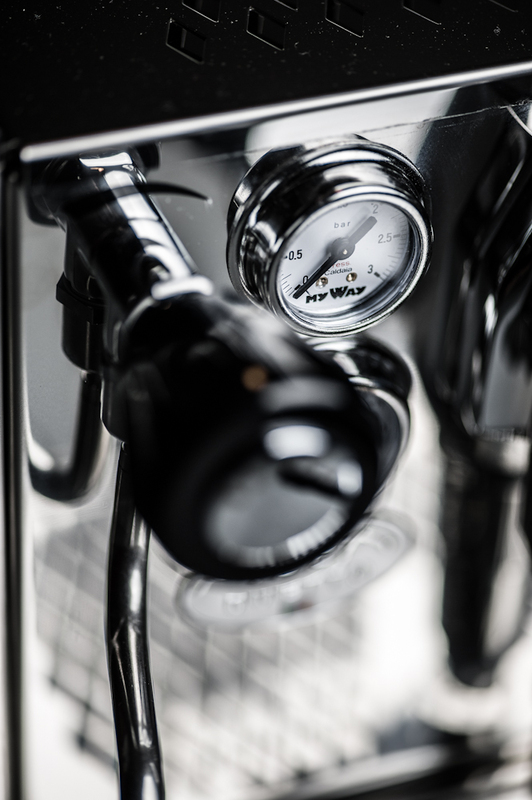 The Alex Duetto II notes the same functions found on a typical commercial espresso maker, which means it has the main espresso making function (in the center group head), a separate steam wand for steaming milk, and a separate hot water wand to dispense water for tea, etc. 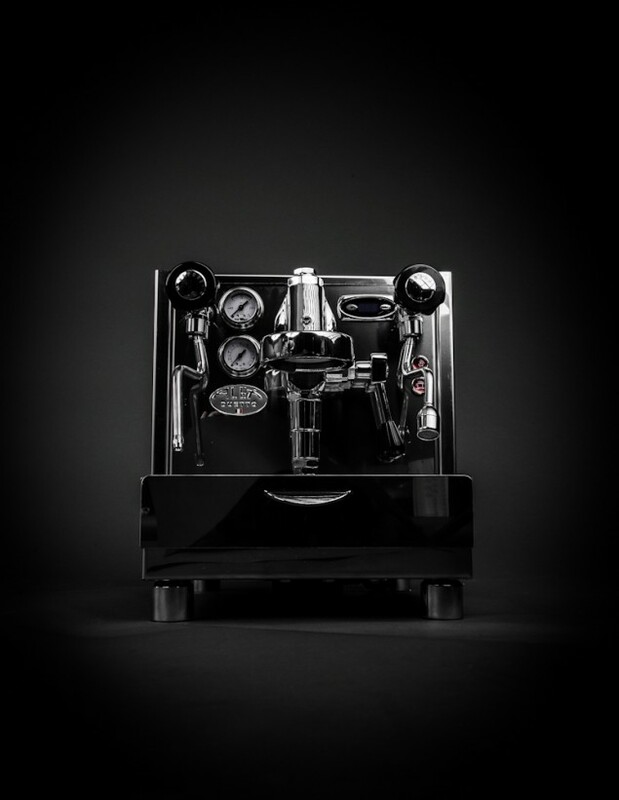 Where the magic really happens, however, is under the hood, where the Alex Duetto II notes a dual boiler design – a design that up until relatively recently, was only available on significantly more expensive espresso makers. 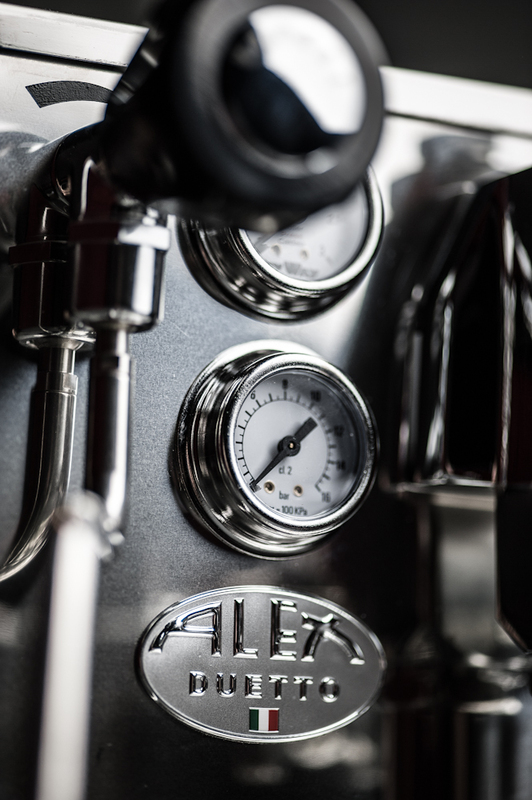 Unlike heat exchanger espresso makers (also known as HX models) that share a boiler, the Alex Duetto II notes separate boilers for the steaming and brewing functions. 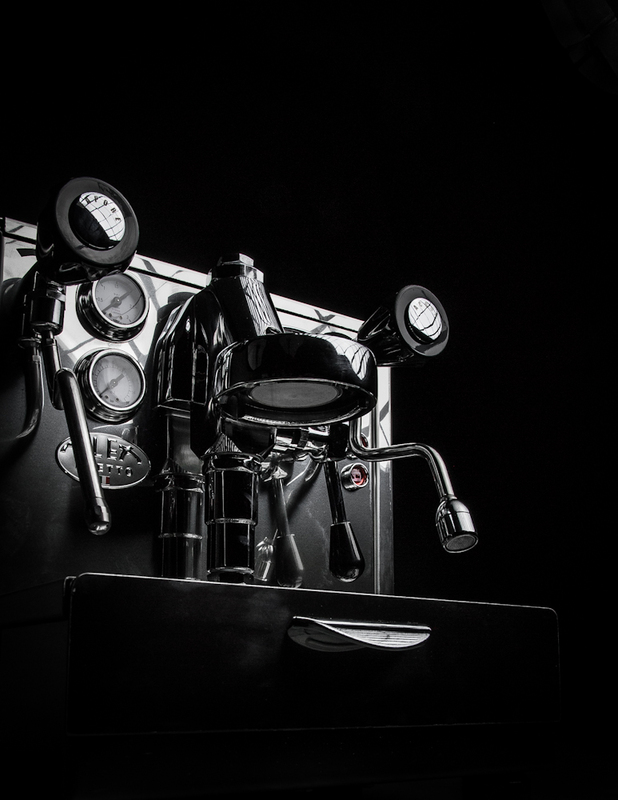 So while both HX and dual boiler machines can produce an exceptional cup of espresso, the dual boiler makes it substantially easier to do so, because temperatures of each boiler are independent of one another. To set the temperatures, the Duetto II features a PID control for each boiler. Simply pick a brew temperature (typically in the 195 – 201 degree Fahrenheit range ), set it on the electronic PID, and the brew temperature is set and remains constant. The same is true for the steam boiler – pick a temperature (which directly affects steaming pressure), set it on the PID, and you’re done. You always have a visual representation of the temperatures for each boiler, completely eliminating any guesswork. Changing the temperatures involves a couple button presses, and that’s it. If you’re new to espresso making, it’s about as easy as you can get. 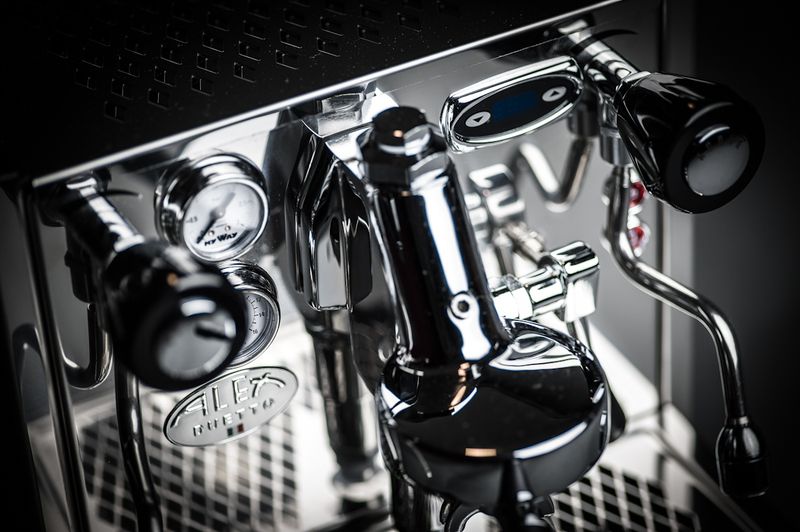 As for the actual brewing, the Duetto II features the highly regarded E61 brew group. 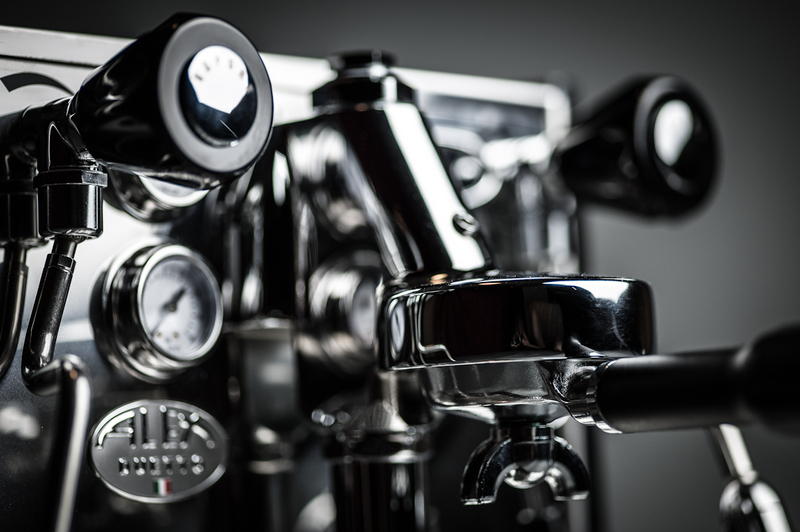 First used by Faema in the 1961 (hence, it’s name), the E61 is the workhorse of the espresso making world, used over the past four decades in a huge number of espresso machines, both prosumer and commercial. 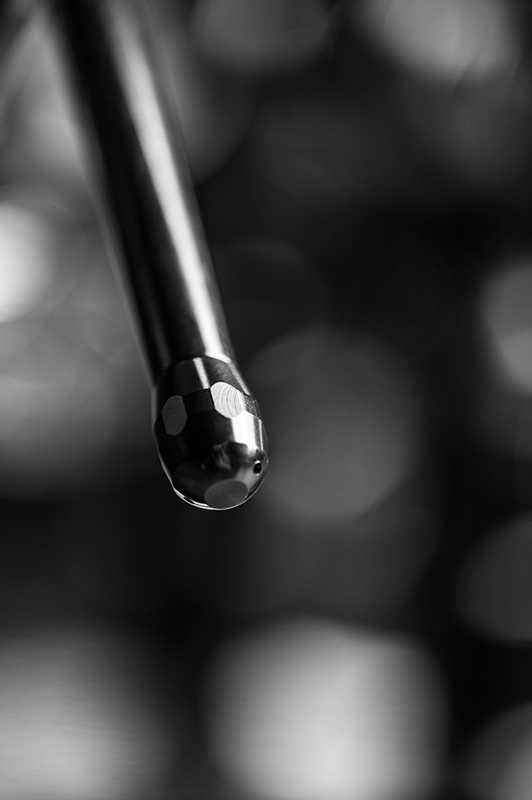 It’s this component that ensures the water temperature from the boiler stays constant all the way through to the coffee, and the E61 is a legend in the industry for doing exactly that. It’s maintains excellent temperature stability, it’s exceptionally robust (meaning if you take care of it, it will give you years of trouble-free use), and in the event you do need to fix it, parts are readily available. There’s a water tank, or you can plumb it in directly to your water supply. There’s a huge drip tray, or you can plumb it directly to a drain with the included drain kit. The steam and hot water wands are insulated, so you won’t burn yourself if you touch them. The Duetto II uses a rotary pump, making it substantially quieter than standard pumps. 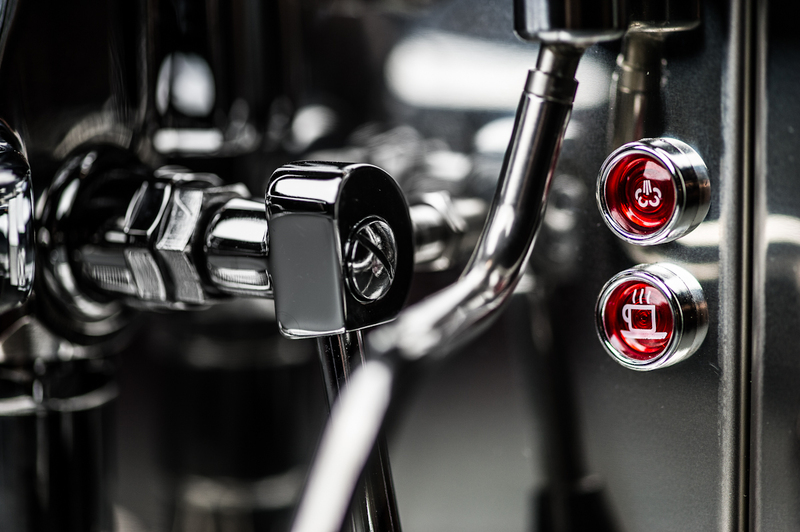 You can turn off the steam boiler independently, meaning if all you’re making is espresso, you can save energy. The final piece of the Alex Duetto II that bears mention is its design. Because an espresso maker will hold a prominent place in your kitchen, design is certainly a factor in your decision making process. 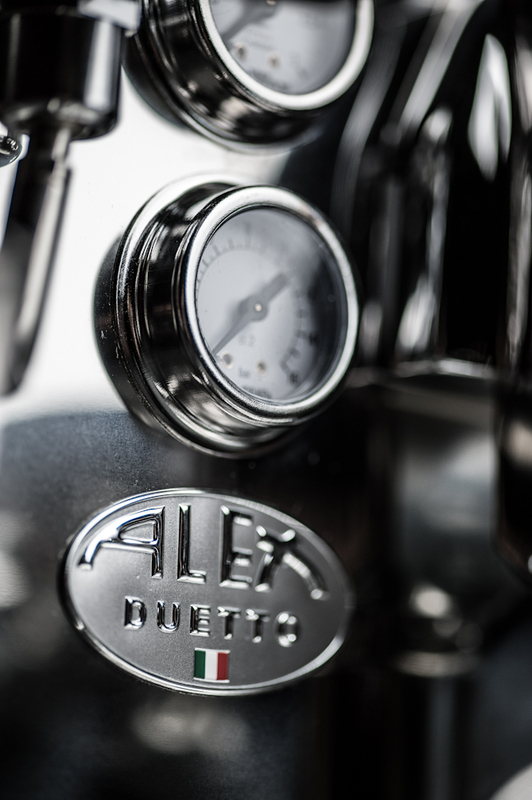 Thankfully, the Alex Duetto II is a gorgeous machine, featuring an entirely stainless steel construction. I looked at several machines prior to my purchase, and for me, the Alex Duetto II easily outranked the other machines, both from a style and fit-and-finish standpoint. Six months later, I still love the design of my Alex Duetto II. It fits beautifully in with the rest of my kitchen, and it receives compliments from almost everyone that sees it. So how does the Alex Duetto II work? Now that I’ve lived with the Alex Duetto II for over half a year, I can tell you that I’m in love with it. I just returned from a month in Italy and France, and I can honestly say there wasn’t a single time I had an espresso or espresso based drink that rivaled those produced by my Duetto. Even here in the U.S., from places like Intelligentsia, I’ve yet to have an espresso that’s brought me more joy than what I myself can produce from the comfort of my own home. Using the Alex Duetto II, as I’ve already alluded to, is about as simple as you can get, even if you’re new to home espresso making. In setting up the unit, the first thing you need to choose is either using 15-amp or 20-amp service. 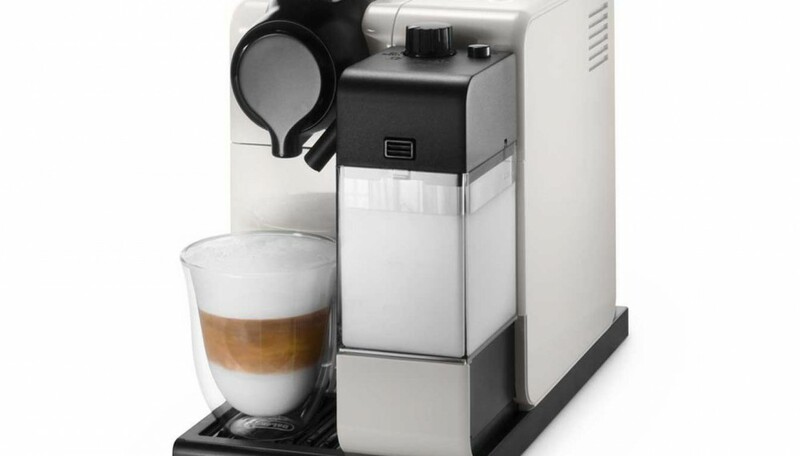 It’s the same machine (the 15-amp uses a cord adapter); the difference is that in 20-amp mode, you can steam milk and make espresso simultaneously; in 15-amp mode, you have do one at a time. I’ve used mine in both 15-amp and 20-amp, and both produce equal results. From there, you have to choose either to plumb in the Duetto II or use the tank and drip tray. Again, you can do both on the fly any time you want. I started using the Duetto II with the water tank and drip tray, then a couple months later I used the included accessories to plumb it in once I had settled on a final location. It’s a very simple process to plumb it in, and once you’ve done it, you’ll never go back to using the tank and drip tray. And that’s really it as far as setup is concerned. My Alex Duetto II came factory set with a brew temperature of 200 degrees Fahrenheit and steam pressure of 1.5 bars, which is the perfect starting point for making espresso and steaming milk. Grind your espresso into the portafilter, tamp, place the portafilter into the E61 group head, flip the lever, and in 25-30 seconds, you’re on your way to making the perfect cup of espresso. Once you’ve gotten comfortable with the process, you can then play with the temperature settings to see how it affects the espresso flavor. To change the settings, you hold two buttons on the PID, which brings up the boiler temps. Press the up arrow to enter the main boiler’s temperature setting, then adjust it up or down to change the temperature. Once you know how to do it, you can adjust the temperature in 5 seconds, at most. Changing the steam boilers settings is likewise just as easy, although once set, you’ll likely never have to change it. As far as consistency is concerned, the Alex Duetto II excels at delivering incredibly great espresso every single time. It’s so consistent, in fact, that in the event there’s a problem with my espresso, I don’t even factor in the Duetto II. Instead, I can attribute it exclusively to an error on my part somewhere else, either in the quality of coffee or in my grind settings and/or tamping. Once you’ve been using it for a couple months, however, and get used to a specific espresso blend, you’re virtually guaranteed your espresso is going to be exactly how you want it, each and every time. It’s absolutely remarkable how easy it is to use, and how stable its performance is. It’s really without fault. 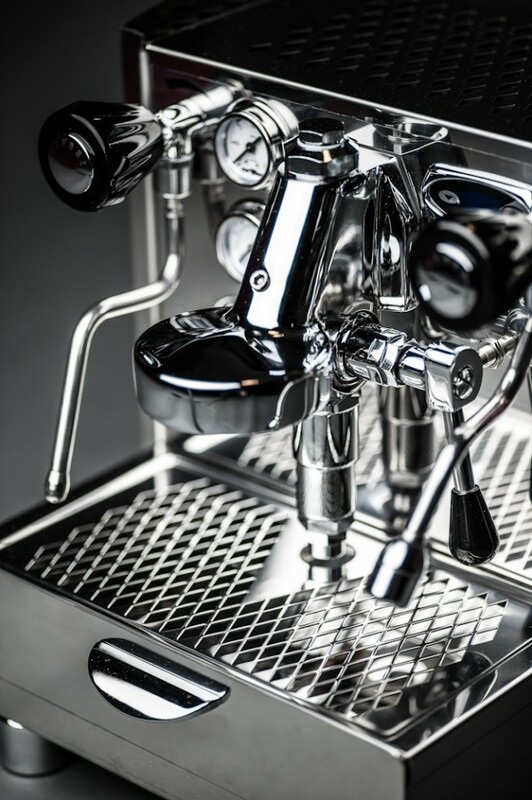 For milk based drinks, such as cappuccino or lattes, the steaming function of the Alex Duetto II works brilliantly, thanks to a 1.8L steam boiler with 1,200 W heating element. If you’re new to steaming milk, this is the most difficult part of the learning process; but once you know how to do it, it becomes second nature. The key to making a milk-based drinks is first understanding what the milk’s texture should be. If you’ve ever been to Starbucks or any coffee house and ordered a cappuccino, you probably received a coffee with a very airy layer of milk on top – so airy, in fact, that as you drank it, the coffee came out without the foam. When you were done, there was probably a layer of foam stuck at the bottom of the cup. This, however, is entirely wrong. Instead, properly steamed milk is known as microfoam in the espresso world (which is used for lattes and latte art), and a slightly more steamed option, which is used for cappuccino. When steaming, correct microfoam gives a glossy appearance, similar to that of wet paint. There shouldn’t be bubbles – it should be universally smooth – and it shouldn’t be too hot (between 130 – 140 degrees). The result is a beautifully sweet milk that completely transforms the taste of your espresso. Latte art gives a more milky drink, whereas cappuccinos have a slightly thicker layer of milk on top, while still blending in with the rest of the coffee. There’s a great video demonstrating a properly made cappuccino on Vimeo, although I typically reserve latte art for lattes and macchiatos. Never having steamed my own milk before, it took about a month before I was fairly comfortable steaming milk with the Duetto II. 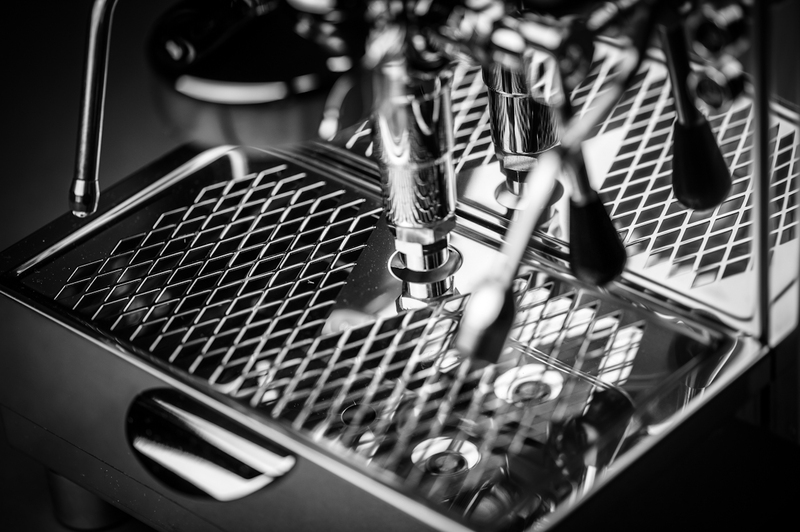 The most difficult part is simply technique – finding the correct spot to place the steam wand during steaming. 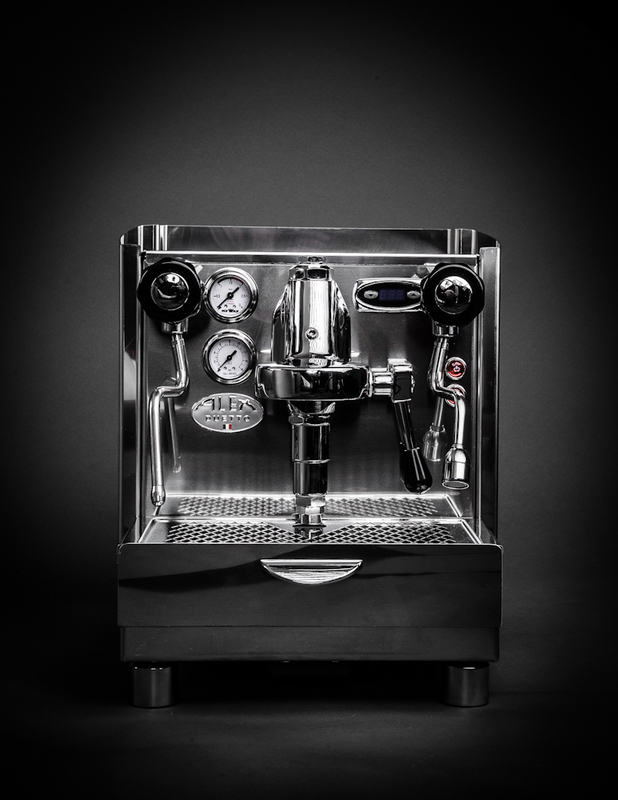 From a power standpoint of the machine, however, the Alex Duetto II notes more power than you need to make perfect microfoam each and every time. 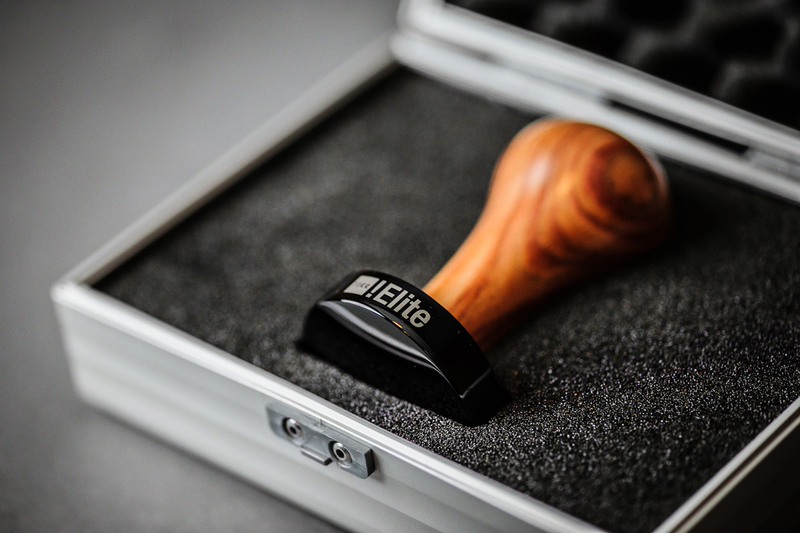 I have my Duetto II set to 1.5 bars of pressure, and it works brilliantly – easily producing results equatable to those from my favorite coffee houses. Firstly, when you’re steaming, keep your hand on the bottom of the pitcher. As it’s nearing the point it’s too hot to touch, stop steaming, otherwise you’ll burn the milk and ruin the texture. All milks aren’t created equal. Use the freshest milk you can find, and experiment with different brands. Here in the Midwest, it’s easy to buy local milk, and I’ve found the fresher the milk, the better the microfoam (and taste). Keep the milk pitcher and milk cold. You want enough time for the milk to properly steam before getting too hot, so keeping the milk and pitcher cold buys you extra time. If you’re wondering how much work it is to maintain the Duetto II, it’s quite easy. After making an espresso, take out the portafilter, dump the coffee puck, wipe, and you’re ready to make another espresso. When I’m done for the day, I run a few seconds of water through the group head, then wipe off the screen. And every few weeks, I run a bit of espresso cleaning solution in a special portafilter to flush out the group head – a process that takes a couple minutes in total. It’s remarkably easy to take care of the Duetto II, and after more than six months of use, it looks and operates exactly as it did the day I bought it. As great as the Alex Duetto II is and has been for me, a huge factor in the decision making process came from where I bought it: Chris Coffee. Chris Coffee is without a doubt the preeminent purveyor of espresso and coffee making equipment, both for home use and commercial use, and I really can’t recommend the entire staff at Chris Coffee highly enough. I can’t tell you how much time I spent researching espresso makers, and Chris Coffee took a tremendous amount of time answering the many, many questions I asked and ensuring I made the right choice. Whether you get the Alex Duetto II or are considering a different espresso maker, talk the to the staff at Chris Coffee, as they’re an invaluable resource for all things coffee. They carry a huge range of espresso makers, grinders, accessories and coffee-related goodness, and they’re easily the best way to get you started on your path to espresso nirvana. And although I haven’t used it, Chris Coffee also has an exceptional service department, so in the event you do have a problem with your machine, you’re always covered with top-notch support. After spending over six months with the Alex Duetto II, it has surpassed what I thought was possible from home espresso. I was confident I’d be able to make good espresso at home, but the fact I can make espresso that rivals that of the best coffee houses is incredible. Even better, however, is that I can do it consistently on a daily basis. 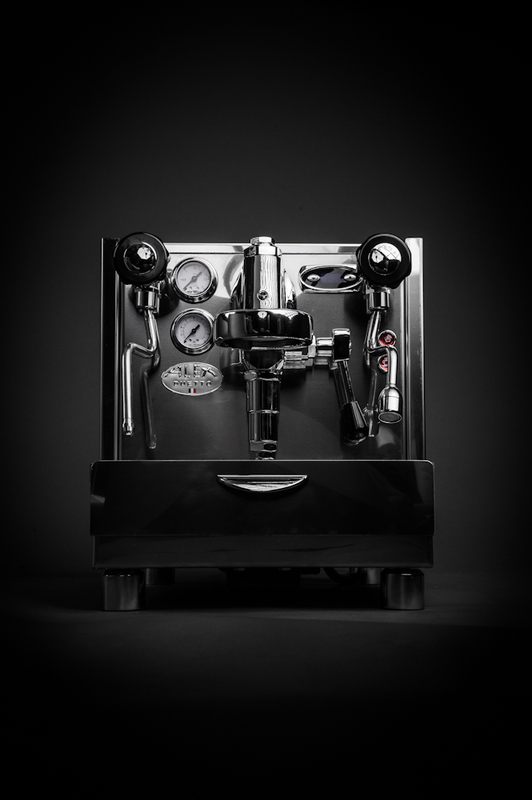 If you love espresso but haven’t made the plunge to a home unit, I can’t recommend it enough. Talk to the guys at Chris Coffee, put the Alex Duetto II at the top of your list, and you’ll be making the best espresso you’ve ever tasted from the comfort of your own home, guaranteed. You can learn more about the Alex Duetto II by visiting the Chris Coffee website (currently the Duetto II is on sale for $2,250), or you can check out photos of my Alex Duetto II in the gallery below. Also, be sure to check out part two of our espresso guide, where we look at the Mahlkönig K30 Vario grinder; and part three of our espresso guide, where we look at Torr tampers and other espresso accessories.